Mayor Galavan’s arrest is front-page news. Barbara is comatose and may never wake, but is being transferred to the medical wing of Arkham. Lee still wants to talk to Jim about the whole Barbara thing and is mad that he visited her in the hospital. Not because she is jealous, but because she’s the devil and a bad influence on Jim. Tabitha is so devastated about Barbara that she hires a hitman to take out Jim. Jim is on his way to meet Barnes at Galavan’s penthouse to search for clues. A seemingly friendly piano tuner with round, red spectacles gets on the elevator with him, and it isn’t long before he reveals himself to be an assassin. He tries to garrote Jim; Jim pulls some parkour moves to escape and the two engage in some pretty entertaining hand-to-hand combat. Jim finally gains the upper hand and knocks out Specs. When he arrives at the penthouse, he drags his catch out and explains to Barnes what happened. Specs’ cell phone rings; his boss is worried when she hears Jim’s heavy breathing on the line. 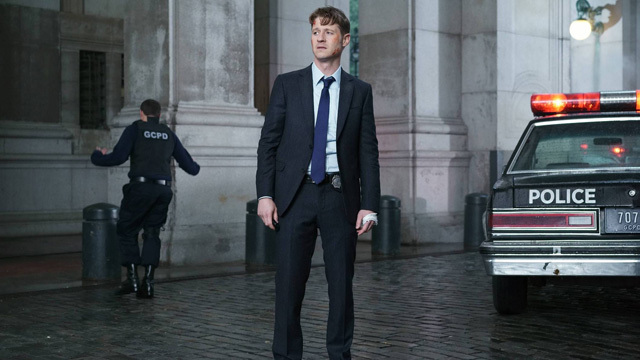 While Barnes is calling for backup, Jim wakes Specs and dangles him out the window, demanding answers. Barnes breaks this up and gives Jim a stern talking-to while Specs smirks in the corner. The hitman pimp (who I am going to call Dame, because she looks like a dame) sends a team of four more killers to take out Jim. Barnes and Jim, still at Galavan’s penthouse, ready themselves while they wait for backup. A newbie cop, Parks, is with them, as is a “civilian” forensics investigator. He, of course, is the first to go when the new batch of assassins arrive. There is a shoot-out which ends with all the assassins dead – well, almost. Turns out Parks didn’t shoot to kill, so Barnes gets stabbed before Jim can land the killing blow. Barnes wants to leave before the next wave of hitmen arrives, but the knife nicked an artery; if he tries to move, he will bleed out in minutes. Jim wants to stay and take care of this, once and for all. Because of Barnes’ injury, Jim wins. The next hitman is a certified lunatic. Eduardo Flamingo was kicked out of Dame’s underground gambling club/hitman hangout because he is a cannibal. When Dame calls him for this job, he is busy torturing one victim while he plays with the tongue of a second victim, currently burning in the furnace. Dame is at the end of the hitman Rolodex, and it seems that she needs someone crazy to take out Jim Gordon. While waiting for backup, Jim admits to Barnes his fears of giving in to his dark side; that he almost shot Barbara in the church when she was begging him to. Barnes shares a story about his third tour and a captured insurgent who tried to escape beneath the cover of a sandstorm. Barnes put his gun in the insurgent’s mouth, intending it to be a threat, but ended up pulling the trigger. Eduardo announces himself on the security camera. He has killed all the backup and promises to eat Jim last – he is dessert. Jim decides to bring the fight to Eduardo, and leaves Barnes and Parks upstairs. On the street, Jim and Eduardo brawl like street fighters. Eduardo has a huge chain, but Jim is one unrealistically bad mofo and gets Eduardo to the ground. He beats him nearly unconscious, and sticks his gun in his mouth. Eduardo waits expectantly, giving Jim crazy eyes. After a long minute, Jim retracts the gun and arrests Eduardo. He puts Parks in charge of booking Eduardo while he goes home and has his wounds looked at by Lee. Lee and Jim finally have their talk, they make up, he promises to never lie to her, yadda yadda yadda. Then a call comes in. Before Parks could get Eduardo into a holding cell, he attacked her, right there in the police station. He sunk his teeth into her neck and wouldn’t let go, despite a dozen officers beating him. Parks is dead, and Jim is silently questioning his decision to let Eduardo live. 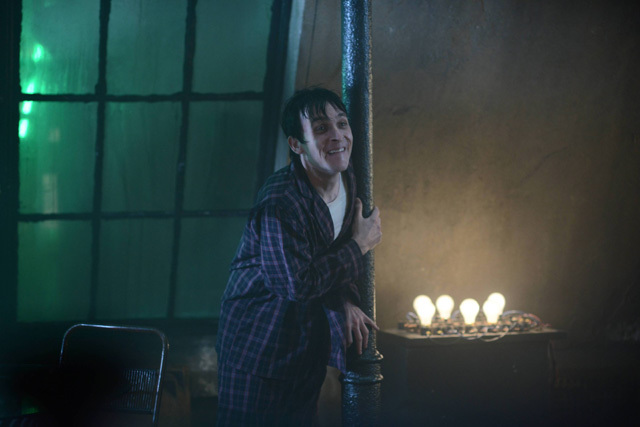 Across town, Penguin is Ed’s unwitting prisoner/roommate. Penguin tries several times to leave, the grief over his mother surely drowning out the fact that he is in bad shape and there is a manhunt on for him. Ed basically wants Penguin to mentor him in the art of being a murderer, and brings him Mr. Leonard, one of Galavan’s men, for Penguin to “play” with. Penguin doesn’t want him and sulks. Ed almost has Penguin when he bonds with him over a lullaby his mom sang for him. Finally, he gets tough and points out that Penguin and Ed are one in the same: they both lost the most important people in their lives. There is nothing holding them back. They have nothing to lose. Penguin finally comes around to Ed’s point of view and the two bond over Chinese food and the torture of Mr. Leonard. Over at Wayne Manor, Bruce is hitting puberty hard. He invites Silver over to pump her for information about his parents’ killer. Alfred sees her and politely – but sternly – asks her to leave. Silver goes quietly, giving Bruce a hug and slipping him her hotel key. Bruce is mad at Alfred; Alfred doesn’t care. It is a typical parent-child battle, with Alfred essentially saying that he knows better, and it will be years before Bruce has the skill to persuade any sort of information out of her. Later that night, Bruce apologizes to Alfred before turning in, promising to call Jim in the morning. Alfred alerts him that he sent the taxi on the main road away, and Bruce plays dumb – until Alfred reveals that he now has Silver’s hotel key. Bruce yells at Alfred and stomps away, the sophisticated, well-mannered version of, “I hate you and I can’t wait until I’m an adult so I can do whatever I want.” He makes one more attempt to sneak out of the house, through a window in the study. This time he is stopped by Selina, who repeats that Silver is up to no good. But this time, Selina says she has proof.